If you’ve never been ziplining on Oahu, how can you choose which one to book? You read the online reviews and quickly realize that all of the ziplines get super-positive feedback, but that doesn’t really help you choose an Oahu zipline, does it? Don’t worry. We’ll help you choose an Oahu zipline that best suits your needs. We need to ask ourselves why are we ziplining in the first place. For most of us, the answer is because it’s thrilling. We’re flying through the air, letting gravity take us to the next tower at speeds that would get us a ticket for driving in a school zone. If it’s just thrills you’re looking for, then you want the longest, fastest zipline. But is that really all you care about? Most people also take into consideration the scenery, price, convenience, challenge, service (guides), and what other activities the zipline facility has to offer. If you simply want the longest and fastest zipline, then we recommend the North Shore Zipline at Keana Farms. Oahu is a beautiful place, no doubt about it. 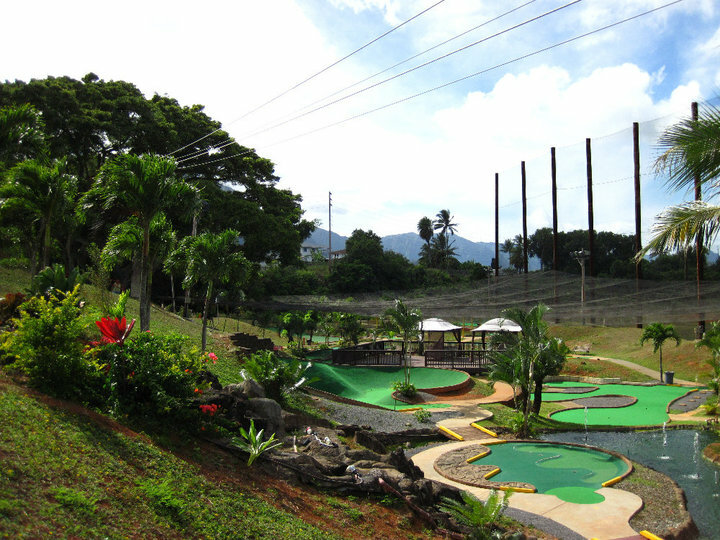 The Oahu ziplines are all located where you have an ocean view and plenty of greenery. As far as we’re concerned the winner in the beauty/scenery category is Kualoa Ranch. There’s a reason that Jurassic World and many other movies chose to film in Ka’a’awa Valley at Kualoa Ranch. It is absolutely gorgeous. The North Shore Zipline is also quite beautiful, and in the winter, it’s not uncommon to see whales from the zipline towers. Both locations get approximately the same amount of rainfall each year. If you were to base your choice of where to zipline entirely on scenery, it would be a difficult choice. For some, money is no object. Others are looking for the best value. From a value perspective, the ziplines of Oahu are priced very comparably. At the moment, Kualoa Ranch is about $20 less than the North Shore Zipline. However, the North Shore Zipline has 8 lines and Kualoa Ranch has 7 lines. The North Shore Zipline has longer lines as well. From a value perspective, they are quite similar. Back to price, if you just want to try ziplining but you aren’t sure you’re going to like it, you should head to Bay View Zipline. For $40 you can go three runs on a 400-foot zipline. After trying that, we’re pretty sure you’ll want more, longer, faster lines. Then you’ll be ready to do a zipline tour. Since most visitors stay in Waikiki, here are approximate drive times from there: Kualoa Ranch is a little under 1 hour away, the North Shore Zipline is about 1.5 hours away, and the trip to Bay View takes about 35 minutes from Waikiki. 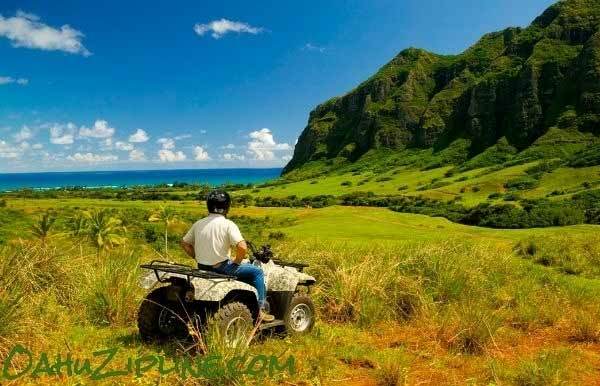 Kualoa Ranch offers transportation at 7am for $15 per person round-trip. The return trip is at 2:30pm, so if you are using their transportation you should consider what you will do with your time after you are finished ziplining. If, for example, you are on the 9 am tour, you will be finished by 11:30 am (approximately). Maybe you’ll want to do another activity – ATV or hike, swim at the beach across the street, or enjoy a leisurely lunch at the Ranch House. The North Shore Zipline has transportation for $30 per person roundtrip and will be adding more transportation times in the near future. Bay View Zipline does not provide transportation. If you’re not renting a car, this option may not be the best for you. A taxi to Bayview from Waikiki will be approximately $60 each way. This is an easy one. All of the ziplines on Oahu have excellent service. The guides consistently receive rave reviews. We have never had a complaint about any of the guides at these ziplines. If your big concern is service, then you will be happy with any of the Oahu ziplines. With so many of the decision factors being relatively equal, the other activities offered at each zipline may be what you need to choose an Oahu Zipline. BayView Zipline is built over a miniature golf course. There is also a driving range on the property. We think that this makes Bay View a great option for a date. You will have a few hours of entertainment with both thrills and skills. The North Shore Zipline is focused on ziplining. They offer a ride on an ATV to get to the ziplines, rappelling on two of the zipline towers, and you will see a working farm, but there are not other activities on the property. Kualoa Ranch is the clear winner in this category. There are numerous tours and activities. We have plenty of guests who have a member of their party that does not want to zipline, or cannot due to physical requirements. In that case, they can join the family on the trip to Kualoa Ranch, but instead of ziplining, take a movie tour or hang out at the petting zoo. There are also combo packages that are extremely popular. The Zip ‘n’ Dip and the Zipline & ATV Adventure combine the same zipline tour with these fun activities. If you are most comfortable booking the zipline that is most popular, then choose Kualoa Ranch. In the summer or 2015 it consistently sold out 7+ days in advance. This may be because of the release of Jurassic World, which was filmed at Kualoa Ranch, or because of its lower price. Whatever it is, it is a very popular tour and guests are happy they chose it. 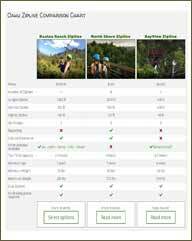 If you are looking for more help to choose an Oahu Zipline, please have a look at the Oahu Zipline Comparison Chart. While we’ve gathered here a great array of options for your outdoor aerial amusement, we will leave it to you to decide which of these exciting adventures is the absolute best zipline on Oahu. So get on out there, and experience the rush of tropical treetop trekking! Thanks for the great comparison. It really helped me decide which one to pick! At Kualoa, do you ride ALL 7 ziplines within one tour? Or do you choose 1 zipline? You ride all 7 ziplines on one tour. Can you wear your GoPro while ziplining? Yes. You can wear a go pro while ziplining. Some helmets have mounts for go pros so be sure to make a note in your reservation when checking out.